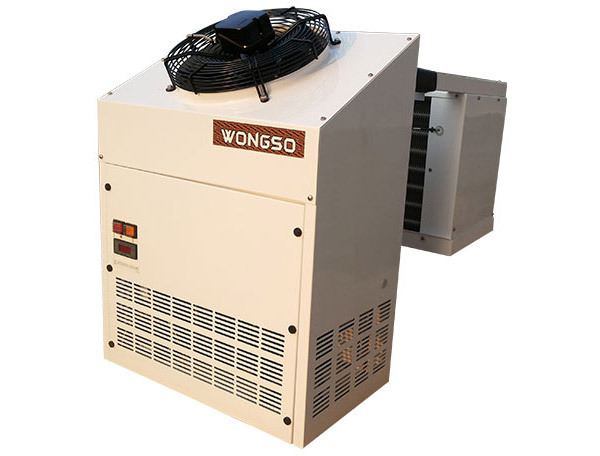 Plug and play walk in chiller freezer is perfect combination of eficient, reliability, easy installation and simple maintenance condensing unit. This unit consist of compressor, condenser, and evaporator that assembled in one compact unit for medium and low temperature application. Start with capacity from 0.5 HP to 2 HP using refrigerant R134a for chiller application and R404a for freezer application. Suitable for people who love simple units and has limited spaces. Performance data at ambient temperatures of +32°C and cooler air intake temperature of +5°C to –18°C. The equipment capacities were measured in accordance with DIN 8942. The sound information is provided as specified in DIN 45635. Because cold rooms only have a very low absorption behaviour, we recommend that calculations are based on only a low reduction in sound levels at other distances.